Printing without a press, Thursday March 19 5:30 to 8PM. Wine will be served. An exhibition of mixed media monoprints by Claire Farrell will be held at Vista Studios Gallery 80808 from March 18 to March 23. The show will include the series “A is for Art,” consisting of 26 mixed media monotypes, one for each letter in the alphabet. 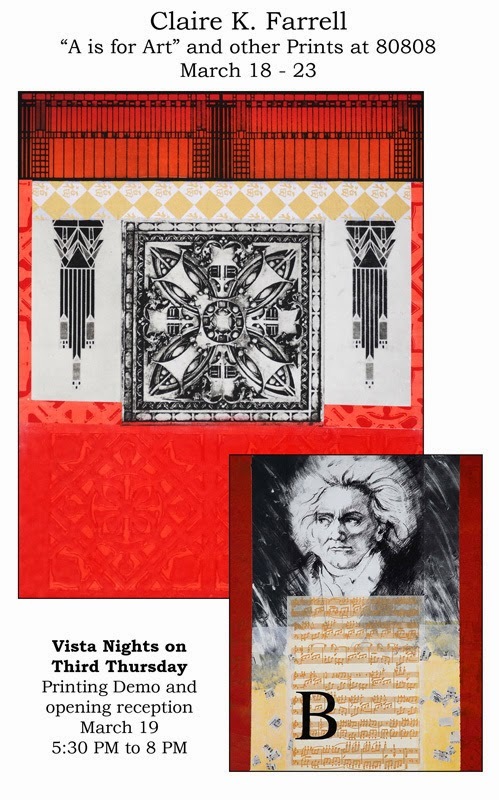 Additionally included will be monotypes inspired by architectural elements including the work of Frank Lloyd Wright and others. Techniques employed in these pieces include monotype, photo etching, drawing, collage, and chine collé. While some of the artworks contain elements that may appear in others, Claire chooses to create only unique works, and each of these pieces is truly one of a kind. While an etching press was used in most of the artworks included in this show, many opportunities exist for creating “prints” without using a press. In conjunction with the exhibition, a demonstration of hand printing techniques will by held by Claire from 5:30 PM to 8 PM on Thursday, March 19. Please join the artist and friends for a glass of wine at that time. Claire is an experienced painter and printmaker, with an advanced degree in Art Studio from the University of South Carolina. Additionally she has studied printmaking at Santa Raparata Art School in Florence, Italy and Penland School of Art in North Carolina. She maintains a studio at her home in Columbia and she works in a variety of media including mixed media printmaking and oil painting.